On August 19, a ferocious wildfire in Chelan, Washington, claimed the lives of three firefighters. That fire, now 50 percent “contained”, has burned about 90,000 acres. Meanwhile, in nearby Okanogan, Washington, five massive fires merged to create a 305,000 acre monster, the largest in the state’s history – and still only 25 percent contained (as of 8/30). Across the Northwest (Washington, Oregon, Idaho and Montana), currently active fires have burned over 1.4 million acres, destroying homes and businesses in their wake. Meanwhile, the U.S. Forest Service alone is reportedly spending $100m per week on fire suppression. With conditions tinder dry and fire crews at their limit, worse may yet be to come. Many of those living near federal forest lands in the Northwest fear a repeat of August 1910, when a single, monstrous wildfire burned 3 million acres in Washington, Idaho, and Montana in two days, killing 92 people. With five times as many people living in those states, such a fire today would likely be far more devastating. 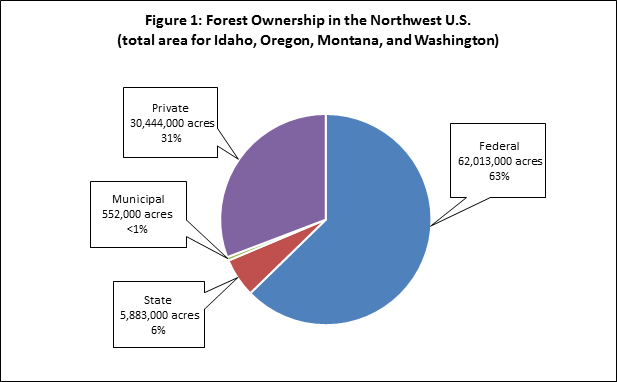 Yet, ironically, today’s problems in large part stem from the misguided federal response to that fire – especially management practices on the 63 percent of forests owned by the federal government (see Figure 1). If worse problems are to be avoided in the future, management practices on those federally owned forests must change. 2015 will likely break records – and that is not a good thing. 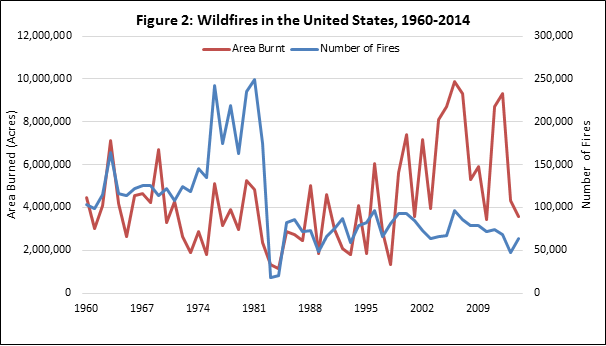 Year-to-date, more land has been destroyed by fire in the U.S. than at any comparable period in the past decade – see Figure 4. 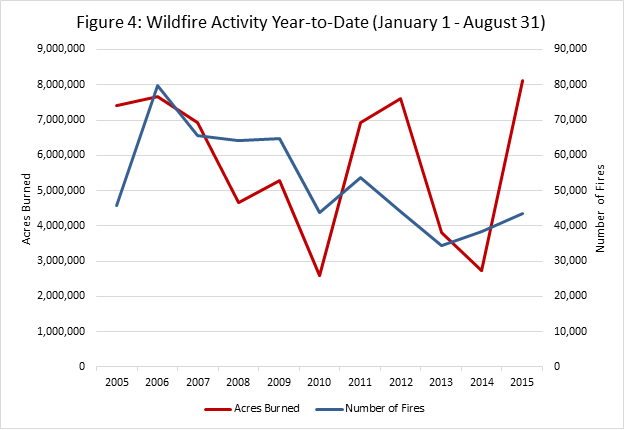 The scale of wildfires in the Northwest this year is in part due to a persistent drought, high temperatures and a snow pack that was well below average and melted earlier. Snowpack typically melts over the course of the spring and summer, providing water to the forest ecosystem. A low snowpack (resulting from below-average snowfall during the winter months), combined with hot summer weather, reduces the availability of water for trees, increasing the likelihood of fires. But such climatic factors cannot explain the pattern of fires observed over the past century. 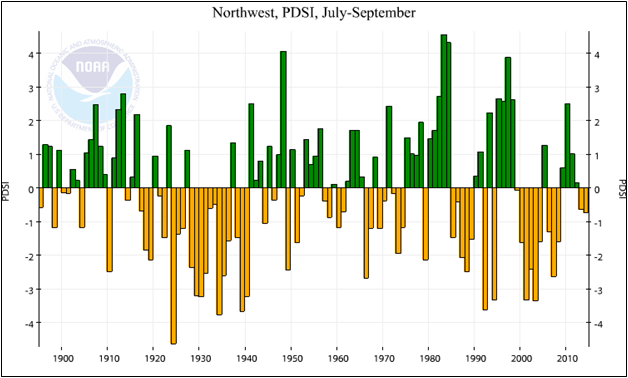 Data from the National Oceanic and Atmospheric Administration show that average winter precipitation in the Northwest (which NOAA defines as Washington, Oregon and Idaho – but the situation is similar for the forested mountains of Western Montana) has not changed significantly since 1895. Although winter temperatures in the “Northwest” and Western Montana show a small trend (though not statistically “significant”) – and were well above average last winter – summer droughts show no particular trend, as can be seen in Figure 5. So, while it is possible that climate change has played a role in increasing the size of fires, the primary cause seems to be forest management practices, which have changed several times over the course of the past 200 years. Prior to European settlement in the early 1800s, Native Americans set forest fires for hunting, harvesting and many other purposes – including fire proofing. These frequent, small, low-intensity fires, usually set at times of year when they were unlikely to rage out of control, burned much of the dead wood and created more park-like forests of variegated tree types and ages, which created favorable hunting conditions. By removing fuel, these fires reduced the number and scale of catastrophic wildfires. European settlement resulted in the collapse of the Native American population – and with it the practice of intentionally setting small fires. Forests reverted to a more “natural” state (i.e. how they might have been without human intervention): pioneer trees such as pine, aspen and larch, were able to mature, while shade tolerant species, such as spruce, fir and giant cedar grew in the understory. In these densely packed forests, trees compete for water and in drier years become severely water stressed and thereby more susceptible to disease and pests. When lightning hits a healthy tree in a lightly packed, variegated forest, the resultant sparks might cause a small fire that clears the understory. In a dense forest full of diseased and dead trees, a lightning strike rises up the ladder created by the thick understory, reaching the crown. The resulting, explosive crown fire then spreads rapidly, especially in arid, windy conditions. Those were exactly the conditions that prevailed on August 20, 1910, when perhaps 3,000 separate wildfires in Washington, Idaho and Montana merged into one. The resulting inferno, driven by ferocious winds, burned about three million acres of forest in two days, killing 92 people, destroying seven towns and displacing thousands of people. Prior to the “Big Blowup”, as the 1910 fire became known, some argued that the U.S. Forest Service, which was founded in…, should carry out small, prescribed burns (essentially imitating what the Native Americans had done), while others – including Gifford Pinchot, first chief of the Forest Service – favored total suppression. The Big Blowup settled the debate: fire suppression became the rule. For decades, the Forest Service’s policy of fire suppression appeared to be highly successful. 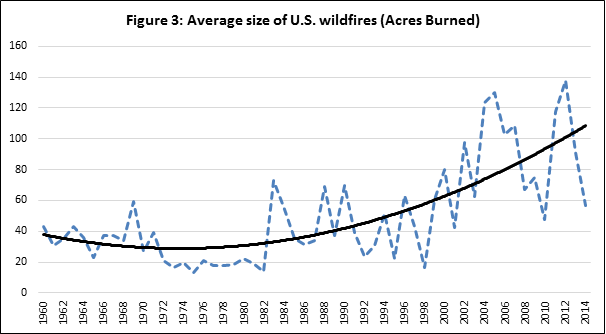 As Figure 6 shows, from 1910 to the mid-1950s, the area of National Forest burned fell from over 1 million acres to around 200,000 acres – and stayed more-or-less constant until the 1980s, when it inevitably began to rise once again. In 1990, the Fish and Wildlife Service listed the northern spotted owl as “threatened” under the Endangered Species Act. Largely in response to this listing, the Forest Service implemented a new “ecosystem management” policy, which resulted in a further reduction in timber harvests. Then, shortly before he left office President Clinton introduced a rule that severely restricted the use of existing roads and construction of new roads on 49 million acres of National Forest, limiting the ability of the Forest Service to thin the dense thickets of trees that resulted from almost a century of fire suppression – or even remove dead trees. 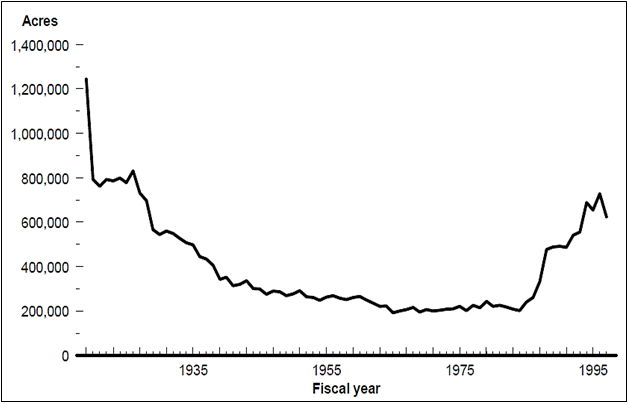 The net result of these changes was a dramatic decline in the amount of timber removed from federal lands. 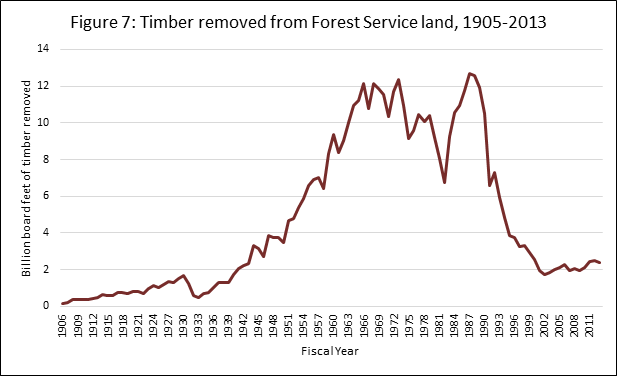 As Figure 7 shows, between 1960 and 1990, an average of 10.3 billion board feet of timber were removed each year from Forest Service land. Removals declined precipitously between 1991 and 2000. From 2000 to 2013, an average of just 2.1 billion board feet of timber were removed from Forest Service land. That represents a near 80 percent decline in removals. Similarly, from 1990 to 2002, timber sales on BLM land fell 74 percent as a direct result of these policy changes and has remained at these suppressed levels since then. As a result of these various factors and especially the combination of very limited removals of fuel (either by logging or by intentionally setting fires) and fire suppression, large crown fires have become the norm in the Northwest, destroying millions of acres of trees every year and threatening people’s lives and livelihoods. 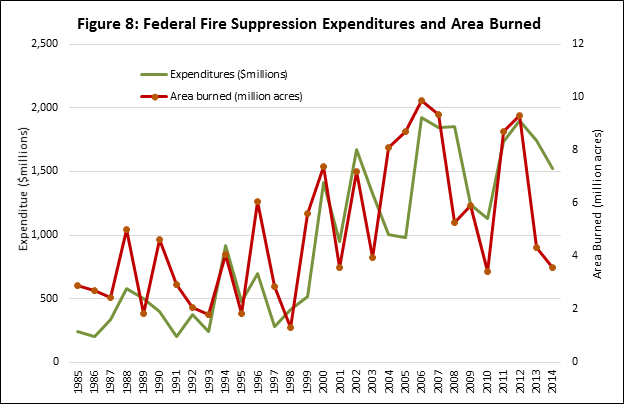 Meanwhile, the Forest Service and other forest-owning federal agencies, including as the Bureau of Land Management, have increased their expenditure on fire suppression in direct proportion to the area burned – as shown in Figure 8. As this year’s fires demonstrate, another megafire like Big Blowup seems increasingly likely. With more people living in or near forests, such a fire could be far more deadly and economically devastating. It would also likely destroy vast swathes of species habitat, including that of the spotted owl. For the sakes of people and the environment, the management of the forests in the Northwest must change. One objective might be to return the forest lands in the Northwest to a condition similar to that which pertained prior to European settlement. That could be done through a combination of ecologically sensitive logging (in most cases, this would mean thinning, not clear-cutting) and prescribed burns, while allowing more wildfires to burn naturally. Unfortunately, this is easier said than done. Past efforts to reorient the priorities of the Forest Service and BLM have often floundered due to pressure from vested interests – and such pressures are unlikely to disappear. Employees of federal agencies seek to protect their jobs. Homeowners and business in forested areas demand “protection” from fires. And environmental activists vigorously oppose a resumption of logging. Remove the requirement that all fires be suppressed unless a fire plan is in place. This would free up the Forest Service and BLM to invest resources according to more locally determined priorities. Make other Forest Service activities self-funding. With federal budgets stretched and unfunded liabilities measured in multiples of annual GDP, this could save taxpayers around $5 billion per year. At the same time, it would incentivize the Forest Service to provide goods and services to people living near its land – for example by selling more timber. Scrap the “roadless” rule. This would immediately remove an unnecessary – and counterproductive – regulatory restriction on logging on federal land. That would enable the removal of hazardous fuels, thereby reducing the threat to species habitat posed by explosive crown fires. It would also improve the economic prospects of those living in towns in the Northwest that have traditionally been heavily reliant on the wood products industry. A complementary approach would see federal agencies transfer some lands to the states – as Don Leal, Ken Ivory and others have suggested. Utah has already passed legislation requesting that it be granted control of federal lands in the state. By reducing their landholdings in this way, the federal agencies would be better able to prioritize their resources and serve the public. Meanwhile, by taking over responsibility for managing resources, states would be able to ensure that those resources are put to uses that are consistent with the needs and wishes of the local people, while better protecting the environment. This is far from an exhaustive list of possible reforms. But it is at least suggestive of what might be done to reduce the potential for catastrophe in the Northwest, while simultaneously improving the prospects of the people living there – and the environment in which they live. In July, the House passed a Bill (H.R. 2647) that would, if enacted, reduce some of the barriers that currently limit the ability of the Forest Service to remove trees that pose a fire risk. It also includes several measures that would increase collaboration between federal agencies and state, county and local communities regarding forest management. These changes might make the Forest Service somewhat more responsive to local needs. However, H.R. 2647 would also fully fund fire suppression activities based on a rolling average of suppression expenditures over the previous ten years. Given that such expenditures have generally been increasing over the past 10 years, this would mean continuous increases in fire suppression expenditures, which would in all probability make the problem of catastrophic fires worse. H.R. 2647 was passed by the House 262-147 on July 9. While the majority of support came from Republicans, 19 Democrats voted in favor, indicating some bi-partisan support. However, the White House declared its intention to veto the Bill should it come before the President. As the Senate considers its own bill to address the mismanagement of forests, it would do well to consider some of the options outlined above that would at least begin to fix the problem.